A behind-the-scenes look at the legendary 2016 New England Patriots season from the rocky start to the superbowl finish by award-winning sportswriter Christopher Price. There are certain moments that simply transcend sports. They become larger than life and bigger than anyone ever thought possible, leaping off the field, the court, or the diamond and into the annals of not only history, but the very fabric of the American milieu. We all just witnessed such a moment on February 5th, 2017, when the New England Patriots battled back from the largest deficit in Super Bowl history to once again become world champions and secure Tom Brady's legacy as the greatest quarterback of all time. Amid a season of controversy, turmoil, and the most tumultuous political climate of our lifetime, the Patriots won. In spite of becoming entangled in the national spotlight on several occasions, the Patriots won. And in spite of being faced with any number of circumstances that would sink almost every other franchise in the NFL, the Patriots won. The season began with the fallout around Deflategate and losing their MVP-caliber quarterback for the first four games of the season, but honestly, the Deflategate saga was just a small part of it all. This is the story of how the Patriots rallied together as a team to surpass their obstacles on and off the football field and how that led to a remarkable run to the title - and the biggest comeback in Super Bowl history. 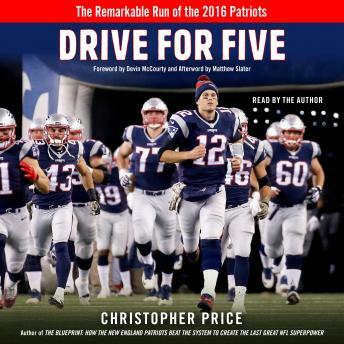 Complete with player interviews, behind-the-scenes stories never told before, and content provided by Patriots players themselves, Drive for Five provides a unique level of insight and access to the story behind the legendary New England Patriots' 2016 season.